Windows Marketplace is the official apps repository where apps can be searched, downloaded and installed onto a Windows Phone 7 mobile device. The Windows Phone 7 has been locked down or system-jailed so that only authorized and approved apps can be installed through Marketplace as source, with an exception of developers’ phone. The new restriction on Windows Phone 7 also marks a departure from Windows Mobile, which allows any apps to be installed either directly on the mobile device itself, or from PC to mobile device. Windows Phone 7 instead only accepts apps OTA (over the air) from the Marketplace. Hackers have managed to take advantage of the convenient provided to developers of apps on Windows Phone platform by Microsoft, to bypass Windows Marketplace and directly sideload or install the third-party applications into Windows Phone 7. The Windows Phone 7 jailbreak and unlock tool is called ChevronWP7. The ChevronWP7 tool basically allows users to load applications directly from PC or sideload into the Windows Phone 7 device, bypassing the WP7 Marketplace, effectively unlock and jailbreak the WP7 for installing any apps from third-party source, or unapproved, unauthorized, illegal, custom or homebrew apps through computer via USB sync cable. In other word, the hack turns the WP7 phone into a developer’s phone, but user is not required to have a developer account. However, the XAP packages of Marketplace apps are protected, and thus cannot be side-loaded. Unlocking also allows the sideloading of experimental applications that would otherwise can’t be published to the Marketplace, such as those which access private or native APIs. ChevronWP7 can runs on any Windows based PCs with Windows XP SP2 or newer, including Windows 7. 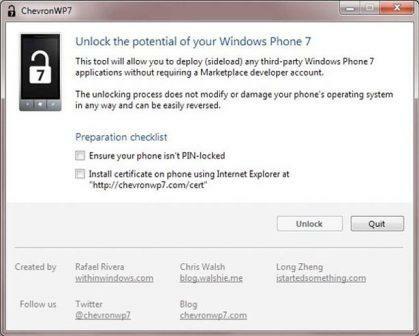 To unlock (not carrier unlock though) the Windows Phone 7, just download the ChevronWP7. With ChevronWP7, users can unlock any WP7 device on the market using a USB cable after a few clicks. If you afraid that the unlock or jailbreak hack voids the warranty, the ChevonWP7 hack is complete reversible, and the app can relock the phone. [application name] has been revoked by Microsoft. Please uninstall it. The error is not due to Microsoft specifically targets Windows Windows Phone 7 devices unlocked via ChevronWP7. Instead, the phone is reverting back as a result of a periodic check by the phone on whether the phone supposedly to be unlocked. When Microsoft responds with a “no”, the phone initiates a lock down. Download and install Zune software. Download and install Windows Phone Developer Tools RTW: vm_web.exe. Unpack the ChevronWP7Cer.zip ZIP archive to retrieve chevronwp7.cer. Email to an email account which accessible on the Windows Phone 7 with chevronwp7.cer as attachment. Open the email on WP7 device. Tap on the attachment once to download the attachment. Once downloaded, tap the attachment again to open the “Install Certificate” screen with white letters on black screen. Click Install at the bottom of the screen to install the cert. Connect the WP7 leave, and leave Zune running. Run chevronwp7.exe, click both checkboxes, and then click Unlock. The phone is now unlocked and jailbroken. chevronwp7.com has withdrew the Windows 7 unlocker, thus it’s no longer supported.